A Painted Victorian Featured in "The Odd Life of Timothy Green"
It’s easy to see why this stunning painted Victorian, known as the Parrott-Camp-Soucy House, was chosen as a filming location for the upcoming Disney movie The Odd Life of Timothy Green. 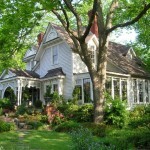 It’s currently a bed & breakfast in the town of Newnan, Georgia, but it’s on the market for $1.39 million. Take a look! The house has 4 bedrooms, 5 baths, and about 5,500 square feet. Stick-Eastlake structures were plain, simple and relatively modern. They were characterized by a large, ornamental truss under the gable eaves of a house. Eastlake houses were so called after British furniture designer Charles Eastlake and featured more decoration. The two styles merged to be called Stick-Eastlake. 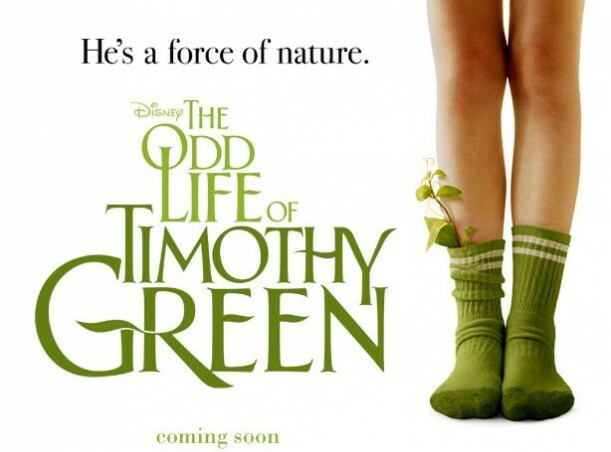 The movie The Odd Life of Timothy Green sounds a little, well, odd itself: A childless couple makes a wish for the perfect child, only to have one show up in their garden after a storm. Not sure what kinds of scenes were filmed at this house for the movie, but based on the trailer, it’s not the one that the couple–and their new “son” Timothy–live in. One of my favorite “new Victorian” kitchens is this one that I showed you a couple of years ago, inspired by the sets in Practical Magic. 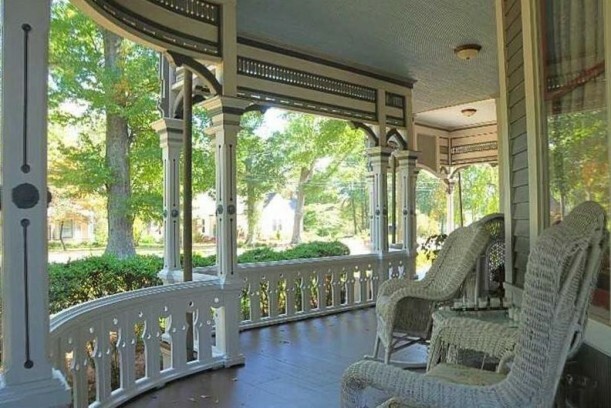 Victorians can be a little dark and formal for me, but I’m a huge fan of the big front porches they usually have. It sits on about 5 acres and comes with a 3 bedroom, 2 bath carriage house. More photos and information in the listing by Suzanne Trammell. P.S. This house makes me think of the Victorian mansion in the classic Disney movie Pollyanna. That one wasn’t entirely real, though. They painted the top floors on. While Newnan’s prices seem to have held a bit steadier than the rest of the Metro Atlanta Area (at least from watching MLS), anything over $1-mil is unusual in Coweta County, unless it is undeveloped land with development or commercial potential. In Newnan, you can usually find a historic home, restored or well maintained, for between $500-800,000 and an unrestored or re-muddled one for about $200,000. It’s a great community and I highly recommend it, though I no longer live in the area. I don’t generally love Victorians because I feel heavy and, okay, a little “ghosty” inside of them, but boy, this one is gorgeous. Those big windows! The stained glass! That porch! It reminds me of those spas that were so popular at the end of the 19th Century, like West Baden in French Lick, Indiana, or the sets of _The Road to Wellville_ or _Somewhere in Time_. Good find. I love the curved front porch on the Victorian. As a child I didn’t like the Victorian style, it seemed like too much at look at, but know I can appreciate it. And I can’t wait to take my kids to the Odd Life. It looks really darling. I absolutely love Victorian architecture, but not so much Victorian decorating. They did a nice job though. I agree about the kitchen – it’s a bit too modern. Definitely would not have gone with the granite. I love Victorian architecture – the woodwork, fireplaces, stained glass. Victorian decorating is way too fussy for me, although they did do a very nice job. The kitchen is a bit jarring, however. I like the “Practical Magic” kitchen, but one of my very favorite movie kitchens is the huge eat-in kitchen in “Moonstruck”. There’s a great house! Completely agree with the Moonstruck house, the kitchen is fabulously large yet comfortable, and very ‘family gathering’ friendly! Beautiful porch, and I am blown away by the architectural detail and paint on the exterior! It’s one of those houses that takes the eyes a long time to really take it all in! Oooooooo! Love it!! The porch is perfect, as is the big bathroom in the photos. A little bit disappointed in the more modern kitchen, but it could be changed. Now where did I put that $1.39……. I tend to agree with you, Victorians are a tad “fussy” and formal for my tastes generally, but this one is beautifully restored. You are right, it is like stepping back in time, so much so that the little R2D2 in the bedroom made me laugh when I saw it there by the fireplace! I loved that they restored it, even if something may not be my preferred style and taste and that tends to change too. The architecture and stained glass is beautiful and I can appreciate that. I don’t tend to think of them as spooky because there are plenty of period films that feature them, “Somewhere in Time” being one of those movies, a movie that I love. I’m with you too as I love old porches. Thank you for posting this. No, I’ve never been to Mackinaw, but I’ve always thought to visit one day. I’d like to visist Traverse City as well. The setting in the novel was actually the Hotel del Coronado, which I’ve been too many times because I grew up in California (it was the setting for the movie, “Some Like it Hot” too. I know for some the movie was probably dismissed as being overly romantic, but I guess I’m just a sucker for that type of thing. I thought the film beautiful. Thank you for your response…one day it will be on my visit list. I love Victorian porches, other than that I wouldn’t want to spend my time dusting all the fancy woodwork to get the dust out, plainer houses are my taste. But this one is too gorgeous to look at, everything is just beautiful in it. I’m sure you can understand how refreshed I am to see this post today :). Sigh, breathe, last week is over! Here’s to the rest of our lives (peaceful lives!). As always, I love good house pictures :). my gosh this house is stunning! I’m a hardware junkie, and appreciate the inclusion of the doorknob and escutcheon. I don’t know if they are reproductions or originals but they are lovely little sculptures in and of themselves. My “addiction” started when I toured the old governor’s mansion in Sacramento, CA, which was orginally built by a family that made it’s money via hardware. Even the mostly unseen parts of the door hinges are elaborately decorated. I am always happy to see the lovely old stuff refurbished and installed in remodels or put to use in new construction. What a gorgeous house! I can tell a lot of heart went into restoring it. I love Victorian homes for their well thought out crafted details, which you don’t see in many homes today. Thank you for sharing this with us Julia! Yay! Thanks for featuring the crown jewel of my hometown. If anyone is interested, Newnan is a really charming town, about 30-45min (depending on traffic) South of Atlanta, with a plethora of historic homes, a beautifully maintained historic town square (with the best darn independent bookstore in the area and great ice cream), the home of Lewis Grizzard, and the BEST BBQ in GA at Sprayberry’s–make sure to visit the old one in downtown, not the newer one by the interstate to get the full experience. Newnan is where Alan Jackson (yes, that one ;-)) went to school and where most of his extended family still lives–he actually grew up in the nearby town of Moreland. Every Labor Day Weekend, Newnan is home to one of the largest (if not the largest) outdoor arts and crafts festival in the Southeast. Power’s Crossroads is fun, pretty affordable, and (if you remember sunscreen and to take it easy in the heat) family-friendly. It’s pretty common to make an experience out of it, by visiting the local antique and junk shops, shopping the downtown boutiques, having BBQ for dinner or lunch, and checking out the new state park in Coweta County. That is an amazing house – not my style – but still amazing. Newnan has quite a few restored old houses (as others above me have said.) I will definitely go to see the movie, since I am a sucker for any Disney movie, even after all these years! Thanks for the heads up on the movie, and for showing the house. Have you heard about the movie being made with Bill Murray as FDR called Hyde Park on the Hudson? I would imagine the home(s) in it would be beautiful. I have also heard they are releasing The Great Gatsby with Leonardo DiCaprio on Christmas Day. That one should also have some wonderful sets. Lovely, every inch! I think that the inclusion of the door knob shows how small details matter. Oh how I love that kitchen! And the porch! I have to say, though, I’m not much for over the top “Victorian”. I grew up in a Victorian home in a gorgeous historic neighborhood, but I like a classic and timeless home without all the gaudiness. What a beautifully restored home. It does seem more cheerful inside than your typical Victorian. Lovely post, Julia! I wouldn’t mind dusting all that lovely woodwork! With a good Sidetracked Home Executives schedule you can do anything. 😉 The whole house just makes me feel like a little kid, looking around and going “whooooooa…” I know Vicorians aren’t everyone’s cup of tea, but I find the whole house to be very inviting. Is there any way to get a super hi-res version of that first veranda shot? It’s as gorgeous as a painting. A little off-topic for this post, but I think that beautiful window over the landing got me thinking about it: have you ever seen Alfonso Cuaron’s version of “A Little Princess”? The way he used space, light and color in the house set, and in the whole movie, is ab-so-lute-ly brilliant. One of my favorite movies for house awesomeness. The only person who would have the hi-res version is the agent (or whoever took the photo). Isn’t it gorgeous? I don’t think I’ve seen that movie. I’ll have to look for it on Netflix–thanks, Cheyenne! This is the period my house was built. I agree with you that doing a kitchen is really difficult in a historically restored house. Our house is no exception. The vast majority of our house was lovingly maintained but the kitchen needs to either be updated from the 1990’s or returned to the 1890’s ! This house is even more wonderful in person— it is located in a whole neighborhood of fabulous period homes. Newnan is about an hour from us; it has great downtown shopping and many, many fine homes that are visible on a car tour. No wonder it is known as “The City of Homes”….. The residential areas are spectacular at Christmas!